It was a lowercase r.
Only 4 pushpins needed, not 5! The Dr, I suppose, stands for doctor. 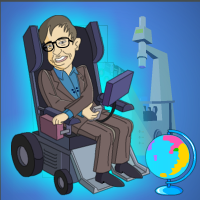 As in, Dr Stephen Hawking.